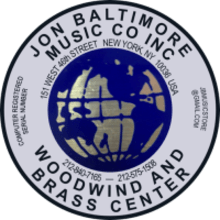 Jon Baltimore Music Co. is one of the last woodwind and brass shops still located in the heart of Manhattan. We cater to all types of musicians from student level to professional, and stock one of the most extensive inventories of woodwind and brass instruments, accessories, and very rare instruments in the city. We also have a full service repair shop on site.